The Hotel is located in a quiet area, away from Napa night life and all noice. 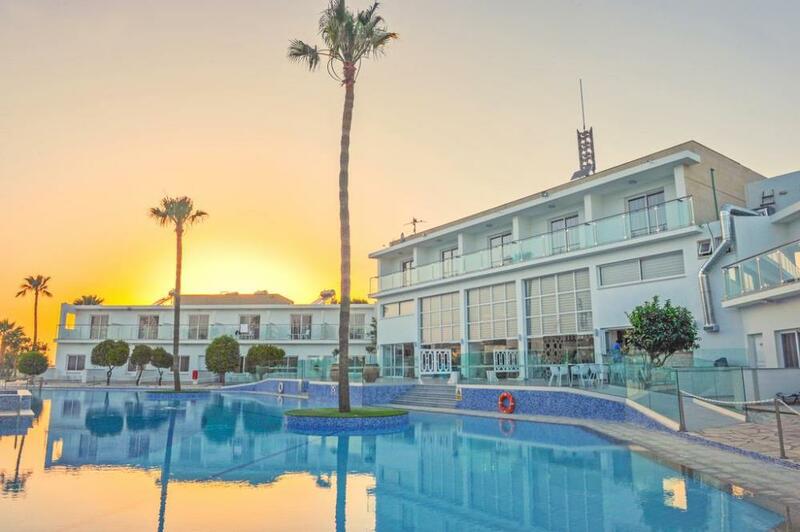 The hotel has 2 big swimming pools with sunbeds and 2 kids pool, plus 1 outdoor jacuzzi pool located in the centre of the hotel, next to a big terrace and gardens. Tennis court also available. Hotel Fedrania is the best possible opportunity to forget all the cares and concerns of daily life and to enjoy a complete rest in its pleasant and congenial surroundings. Its aim is to provide you with every comfort so that you can have your best vacation ever, to make your stay at the Hotel Fedrania the holiday of your dreams. 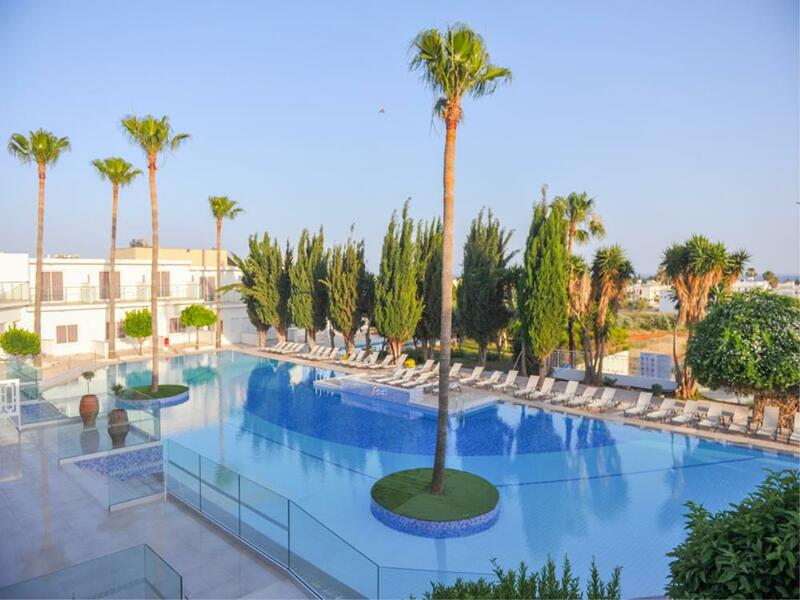 Fedrania Hotel is s 300m from the beach and only 1,5km away from the center of Ayia Napa, easily accessible to all the restaurants, pubs and shops. 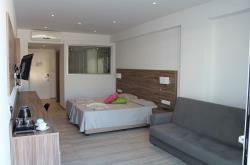 The hotel has 24 Studios and 30 one-bedroom apartments all with fully equipped. 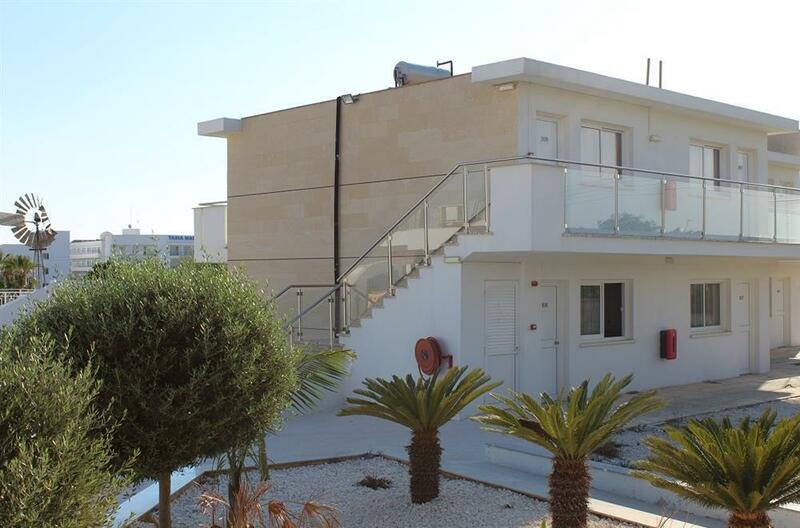 Fedrania Hotel Apartments provides good quality service and its value for money. The hotel has 24 Studios and 30 one-bedroom apartments. 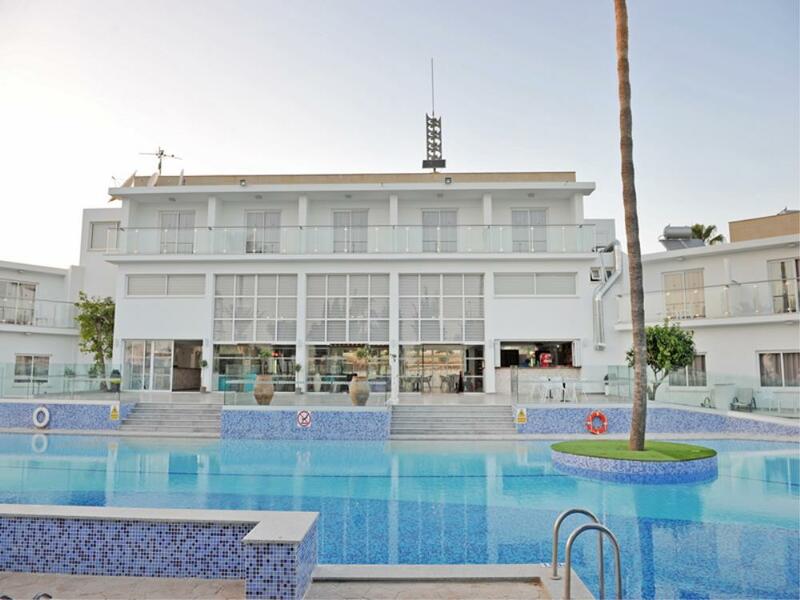 Fedrania Hotel Apartments pool bar opens from 10:00 in the morning with happy hours and special prices& nargyles, pizza slice and hotdogs serve. Breakfast is also available at an extra cost. There is wireless internet (payable) in all the hotel plus off licence shops open 24 hours. Reception offers a luggage room and self service laundry. 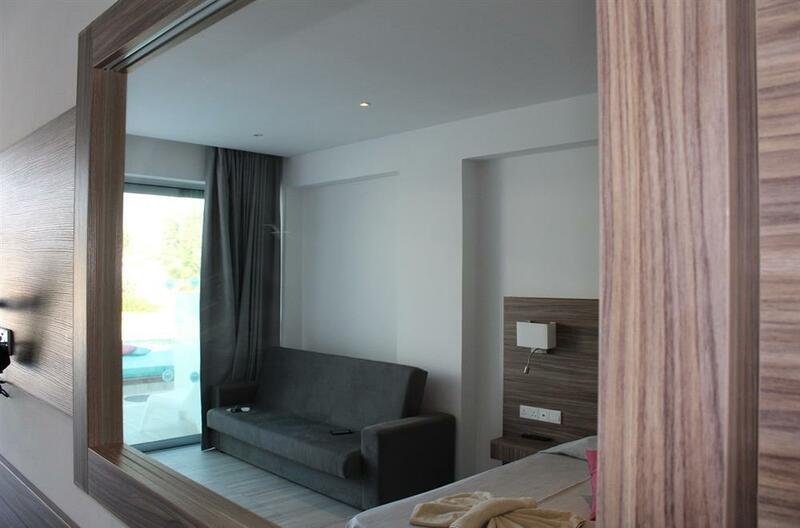 Hotel residents have free entrance to Ayia Napa clubs (please ask Reception). The hotel has a cosy library, a lobby/lounge bar/ restaurant which serves breakfast, lunch, dinner, snacks, deserts, coffee, etc. Also, outdoors you can find a fish lake, a tennis court, and a playground. The hotel has 21 Studios and 32 one-bedroom type all renovated in 2015, equipped with 2 single beds, A/C & heating (in bedroom), LCD TV, safe deposit box (at a charge), mini fridge/mini bar (at a charge), modern shower with WC, terrace or balcony and Wi-Fi (at a charge). 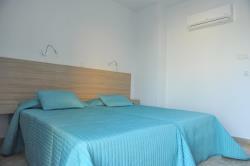 Studio rooms can accommodate up to 2 guests maximum and the one bedroom up to 4 guests. The one bedroom rooms also provide living room with sofa beds. Double Twin Room equipped with 2 single beds, A/C & heating (in bedroom), LCD TV, safe deposit box (at a charge), mini fridge/mini bar (at a charge), modern shower with WC, terrace or balcony and Wi-Fi (at a charge). One Bedroom equipped with 2 single beds, A/C & heating (in bedroom), LCD TV, safe deposit box (at a charge), mini fridge/mini bar (at a charge), modern shower with WC, terrace or balcony and Wi-Fi (at a charge). The one bedroom rooms also provide living room with sofa beds. Additional services on request at a charge payable locally. In addition, Fedrania Hotel offer to the guest a pool bar that offers snacks. 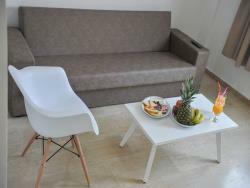 The facilities comprise of a pool bar, swimming pool, sauna, wireless internet, snacks. The animators have an excellent co-operation with tour-operators reps organizing happenings every day – and night.